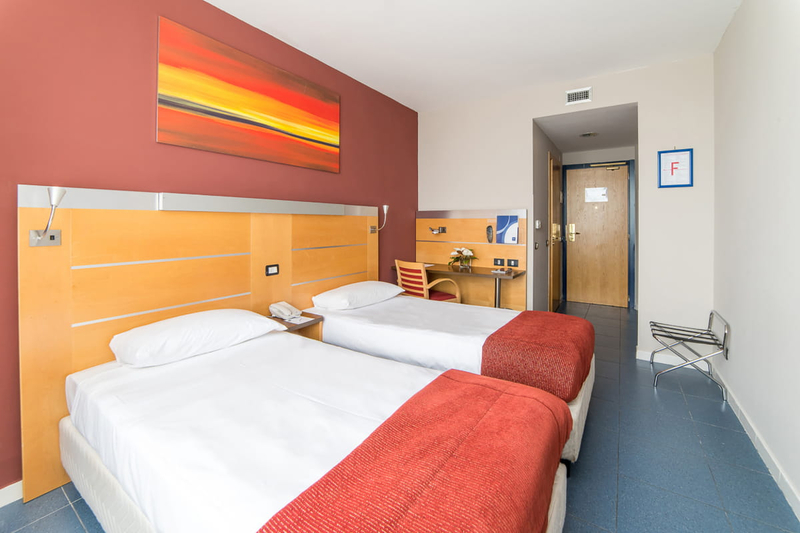 The Standard double room DUS is furnished in modern style with a King Size bed 180x200, air conditioning, telephone, TV, safe, minibar (on request only), hairdryer, private bathroom with shower and courtesy set. Modern and functional furniture. WiFi connection and breakfast always included. The Standard double room is furnished in modern style with a King Size bed 180x200, air conditioning, telephone, TV, safe, minibar (on request only), hairdryer, private bathroom with shower and courtesy set. Modern and functional furniture. WiFi connection and breakfast always included. The Standard Twin room is furnished in modern style with two single bed 90x200, air conditioning, telephone, TV, safe, minibar (on request only), hairdryer, private bathroom with shower and courtesy set. Modern and functional furniture. WiFi connection and breakfast always included. The Standard Triple room is furnished in modern style with two single bed size 90x200 and a sofa bed 140X200, air conditioning, telephone, TV, safe, minibar (on request only), hairdryer, private bathroom with shower and courtesy set. Modern and functional furniture. WiFi connection and breakfast always included. The Standard Quadruple room is furnished in modern style with two single bed size 90x200 and a sofa bed 140X200, air conditioning, telephone, TV, safe, minibar (on request only), hairdryer, private bathroom with shower and courtesy set. Modern and functional furniture. WiFi connection and breakfast always included. 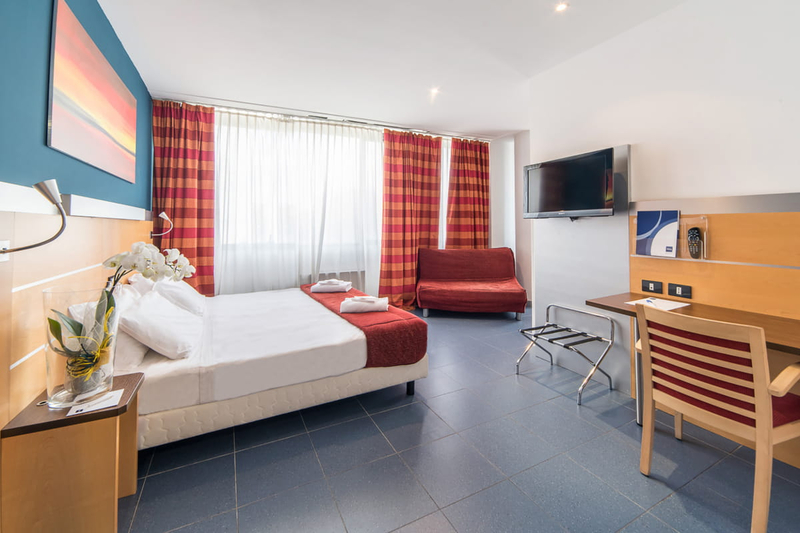 The 86 spacious and bright rooms at the Idea Hotel Roma Nomentana are equipped with all modern comforts. 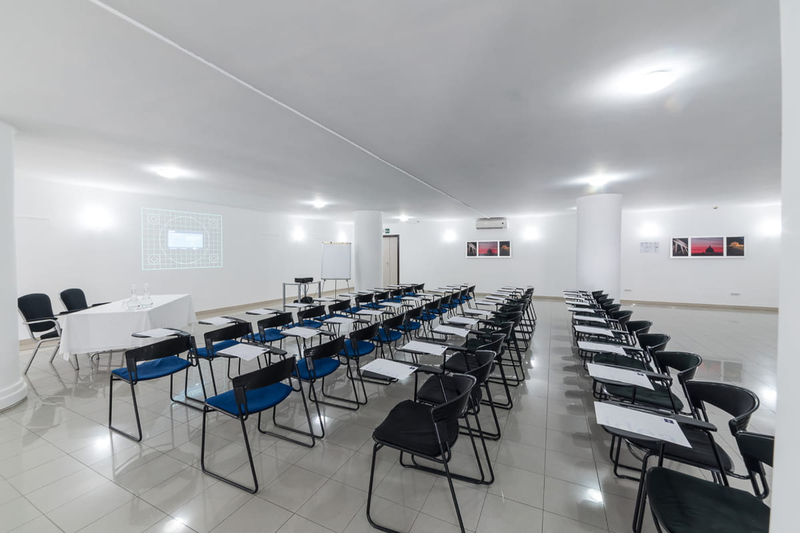 The Idea Hotel Roma Nomentana has WiFi Internet access (FREE) in the rooms and public areas. There is also an indoor parking fee (€6 per day) and a public outdoor car park (FREE of charge). (The Minibar is only available if required during the booking process). The furnishings of the rooms are simple and essential. The large square meters (13 sqm Standard rooms – 20 sqm double rooms) make the rooms comfortable and comfortable for long stays. Children up to 9 years old are accommodated for free in the bed with their parents. Alternatively for children aged 10 years there is a surcharge for the extra bed on the cost of the room. 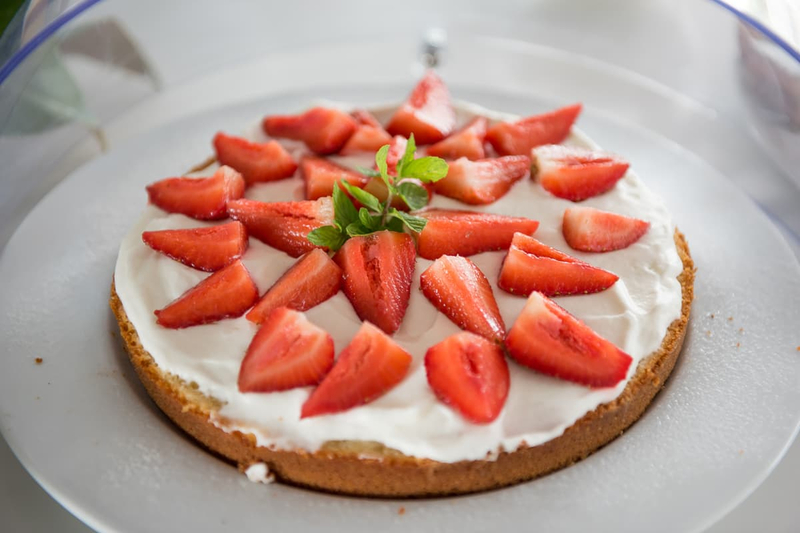 The restaurant of the Idea Hotel Roma Nomentana offers traditional Roman dishes and the classics of International cuisine revisited in Italian style. The opening is only nightly from 19:30 to 22:30 every night. We also offer original light lunches and buffets on request. Morning breakfast is our battle horse. 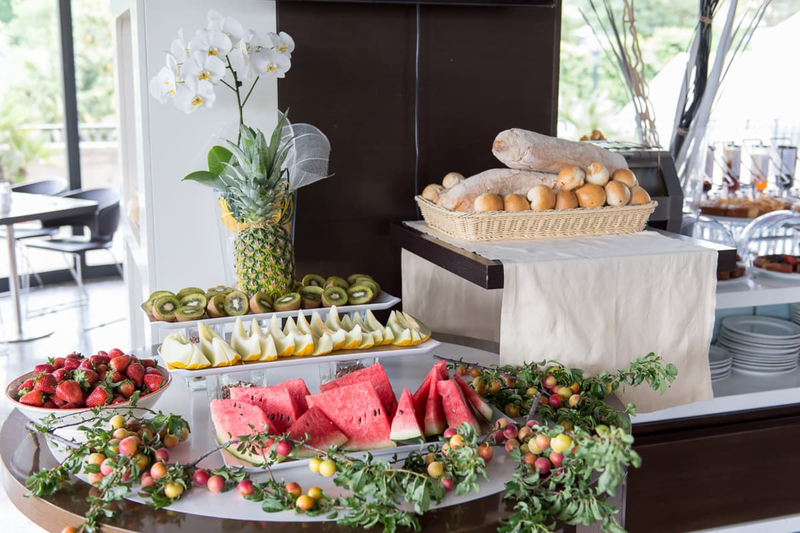 Every day our pastry chefs create and bake sweet and savory products for an extremely delicate and delicious continental breakfast. 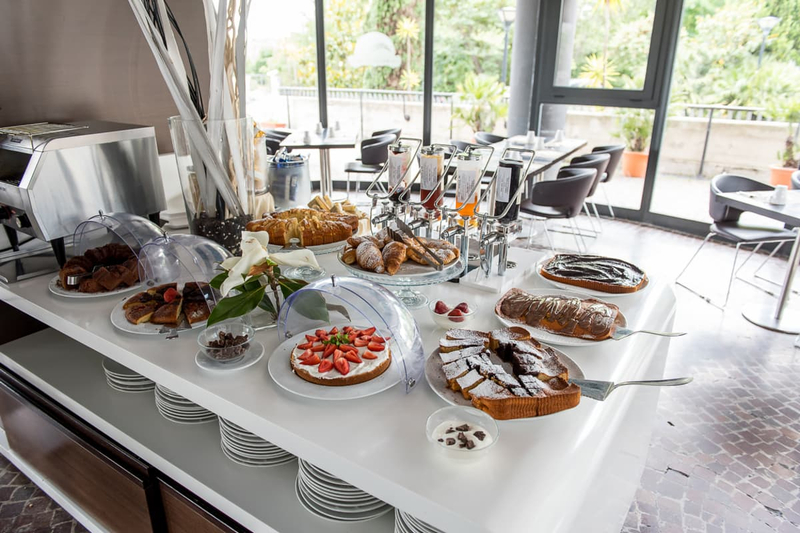 You can enjoy it in the internal breakfast room and during the beautiful seasons in the terrace overlooking the Aniene Park. 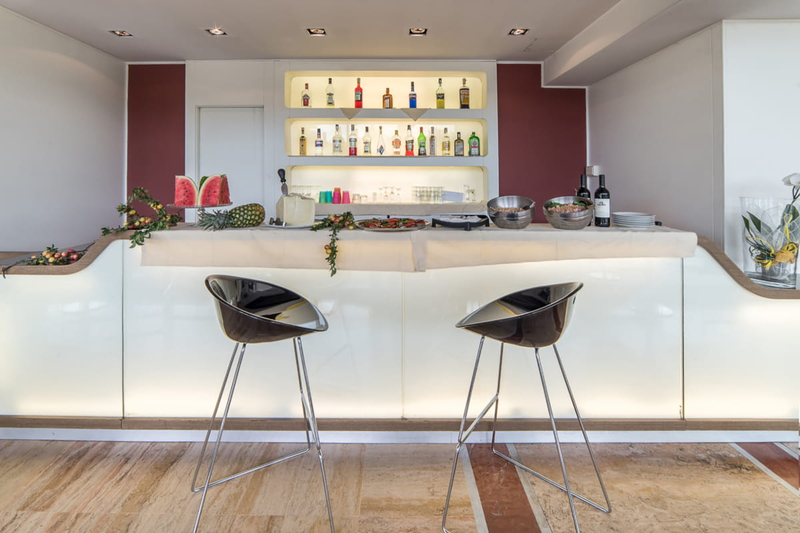 The bar is open daily from 18:30 hours for a coffee or a delicious aperitif. 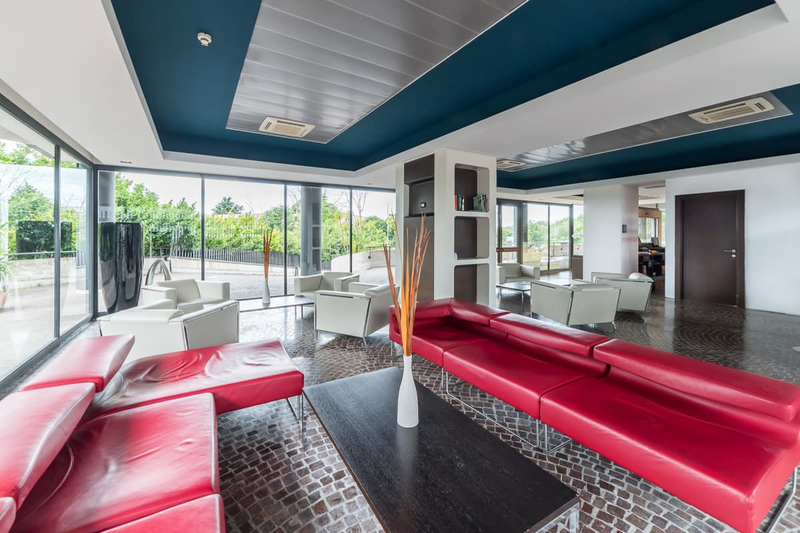 Adjacent to the Idea Hotel Roma Nomentana are the club Virgine Active and Italian fitness that offer several fitness rooms, wellness centers, spa and personal trainers available 7 days out of 7. A few kilometers also the shopping center Porte di Roma e Roma Est, where you will find Uci Cinema and more than 300 shops. Take the Grande Raccordo Anulare ring road and exit at Exit 11 Nomentana - Motesacro, continue for 2km along Via Nomentana towards Centro and turn off at Viale Kant, continue 500 meters up to Via Galbani and then turn into Via Attilio Benigni. From Rome Fiumicino Airport (FCO): Take the Grande Raccordo Anulare and exit at Exit 11 Nomentana - Motesacro, continue for 2km on Via Nomentana towards Centro and turn at Viale Kant, continue 500 meters until Via Galbani and turn finally in via Attilio Benigni. 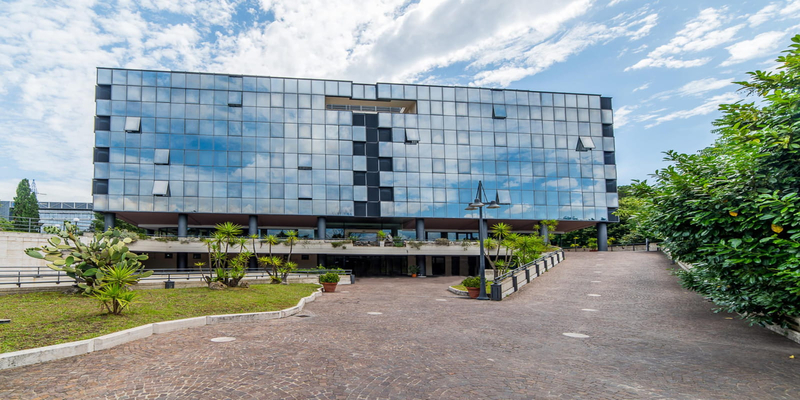 Alternatively: take the "Leonardo Express" train to Tiburtina station, continue by taking the blue "B" subway line, to the Ponte Mammolo station, continue by taking the Bus 341 or 350 and get off at Via Galbani. From Rome Ciampino Airport(CIA): Take the Grande Raccordo Anulare and exit at Exit 11 Nomentana - Motesacro, continue for 2km on Via Nomentana towards Centro and turn at Viale Kant, continue 500 meters until Via Galbani and turn into via Attilio Benigni. Alternatively: take the Cotral (extra urban bus) to Anagnina Station, continue with the red underground line "A" and get off at Termini Station, change the underground line and take the blue "B" line to Ponte Mammolo Station. Continue with the Bus 341 or 350 and get off at Via Galbani. From the city center (Piazza di Spagna - Via Del Corso) take the red subway line "A" and get off at Termini station, change the underground line and take the blue "B" line to the Ponte Mammolo station. Continue with the Bus 341 or 350 and get off at Via Galbani. 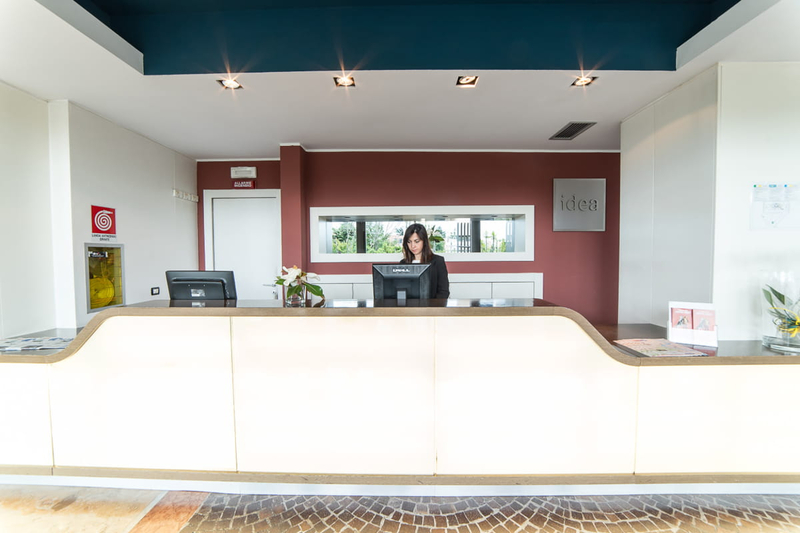 Enter your email to keep informed about promotions, offers and events on Idea Hotel Roma Nomentana.